Reading the headlines lately, it’s easy to get swept up in a general feeling of optimism about the business financing climate. Angel investors are pouring more money into startups. Venture capital has rebounded in a big way. The SBA backed record numbers of loans to small businesses in the last two years. And on top of all that, alternatives like crowdfunding are poised to open up brand new avenues for businesses seeking capital. These stats, along with widely circulated rumors of a tiny startup turning away billions of dollars, paint a picture that couldn’t be further from the truth for most entrepreneurs today. 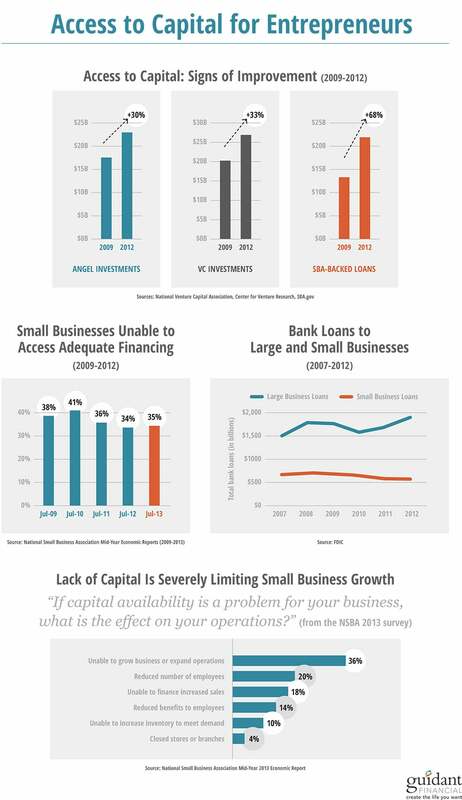 According to a July report from the National Small Business Association, 35 percent (which is worse than last year, when the reported number was 34 percent) of small businesses were unable to access adequate capital in 2013. While that’s a significant improvement over the peak-recession statistics, that still means roughly 8 million small businesses are strapped for cash and unable to hire, take on new clients, or sadly, even keep their doors open. Where’s the disconnect? Why aren’t small businesses and franchise operations seeing greater access to credit, when so many indicators are trending up? As the credit markets begin to bounce back from the Great Recession, the recovery is strongly skewed in favor of large enterprise – and small businesses are being left out in the cold. This combination of diminished collateral value and tightened lending standards is creating a lending gap between small and big business. According to the FDIC, small business loans (classified as loans under $1 million) have been steadily declining since 2008, even while large business loans have already recovered to pre-recession levels. The problem is even more pronounced for loans at the very low end: according to a survey by the New York Fed, small businesses seeking loans of less than $100,000 were only successful 57 percent of the time -- compared to a 73 percent success rate for those seeking loans above $100,000. This is particularly troubling in light of the report’s other finding: half of all small businesses fall into the sub-$100,000-loan-seeker category. It’s the nature of small business that financing day-to-day operations and staying afloat during difficult periods can occasionally require some capital assistance. Even in good times, as when an opportunity to expand arises, most entrepreneurs are unable to make a huge capital outlay on their own. These challenges are proving particularly difficult to overcome in the current credit crunch: 36 percent of small businesses were unable to expand operations and 20 percent were forced to reduce their staff due to lack of access to capital, according to the 2013 National Small Business Association survey. For the time being, it seems that small businesses have no choice but to get creative on the financing front. Luckily, we’re talking about one of the most creative, resourceful, and resilient groups of people I know of: entrepreneurs! If you’ve tried going down the typical financing path and been rejected, don’t give up. Over the last ten years I’ve seen hundreds of entrepreneurs who didn’t get a second look from the banks persevere and build their dream business -- all without the help of traditional bank financing. How it works: Lenders offer fast cash advances and charge high repayment fees. Collateral is not required and paperwork is minimal. Best candidates: High cash flow businesses seeking up to $200,000. Popular with restaurants and small retailers. Downside: Loans carry extremely high fees and must be repaid within a year. How it works: Lenders can offer unsecured credit (meaning no collateral!) to new and existing entrepreneurs simply based on their credit history. Funding can be secured in as little as 45 days and it’s revolving, which means you can draw down as necessary, pay back, and rinse and repeat. Best candidates: Entrepreneurs with extremely strong credit scores and credit history, as this type of credit generally requires a personal guarantee. Downside: Loans carry high fees. How it works: An entrepreneur can invest up to 100 percent of his or her retirement assets into a business or franchise without taking a taxable distribution or getting a loan. The plan becomes a shareholder in the business and thus there are no interest payments, nor does it have to be paid back in a specific window. Best candidates: Entrepreneurs and business owners who believe that diversifying retirement assets into their own business is a great investment. Downside: As with any investment, there is the potential for loss. Additionally, the tax and ERISA rules are complex, so working with a qualified firm is a must. If you find yourself among the ranks of the 8 million entrepreneurs who are unable to access adequate capital, one of the above options could be the way forward for you. You do not have to wait for the banks to come around -- it could be another year, or another ten years. Know your options, research them in depth, and find the alternative best suited to take your particular business to the next level.